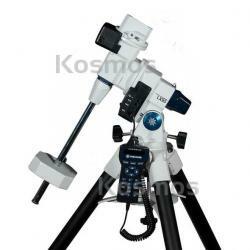 LX85 German Equatorial Mount (33lbs), Kosmos Scientific de México, S.A. de C.V.
Meade’s new LX85™ Series features a high-quality, portable, GoTo, German equatorial mount with AudioStar® Hand box. The LX85™ Series is the perfect choice for the cultivated observer and astro-imager looking to chase deep sky objects! Use as a stand-alone mount or maximize your viewing potential with an array of different optical tubes to choose from. Meade’s LX85™ Series will keep you looking up for many years to come and sets a standard for mid-sized telescopes at a great price. The LX85™ features a Vixen-style dovetail receiver for mounting observing equipment up to 33 lbs., coupled with a sturdy build and low-cog servo-motors that ensure smooth tracking performance. This stable mount can impressively handle slight load imbalances with ease. With its built-in integer gearing motor drive, you’ll be able to track through long exposures using Meade’s Smart Drive feature for recording permanent periodic error correction (PPEC). Seamlessly image the best parts of the night sky without having to worry about performing a meridian flip. The LX85™ mount also includes an integrated autoguider port to readily connect to your autoguider camera, making your astro-imaging experience easy and straightforward. If these features weren’t already enough, the LX85™ is compatible with the Meade Zero-Image Shift Electronic Micro focuser and wired illuminated reticles. With the included AudioStar® hand controller you have easy access to over 30,000-objects that you can view with a simple press of a button! AudioStars®Astronomer Inside technology features a built-in speaker that plays over four hours of educational content about the celestial objects you view! Capable of handling a wide variety of optical tubes and equipment, expandable and upgradable, the Meade LX85™ mount is designed for you to rediscover the night sky again and again. Whether you are at a beginner level or you’re venturing into astrophotography, the LX85™ Series is the portable and reliable mount to grow with your level of experience.